As we leave behind 2018, we leave a period that is better off put in the bin as far as Irish soccer at international level goes. It was one problem after another both on and off the pitch and it culminated in the sacking of Martin O’Neill and the appointment of former manager Mick McCarthy, a decision that has been well received by the fans and the media. If the truth was to be told O’Neill should have departed after the play off disaster against Denmark but so much has been said about that result we will just leave it behind. The mood coming to the end of 2018 was very down and disconsolate but things could just be about to take a turn for the better. The draw for the 2020 European Championships has come and gone and it certainly was not the worst draw in the world for the new manager, mind you it could have been a lot worse if it had not been for the removal of the Republic of Ireland from a group which contained Germany and Holland, apparently it was pre planned that hosting nations could not been placed in the same group, you would have to agree that it was not bad as qualifying groups go. Mick McCarthy will have to hit the ground running if his side are to get to the finals and they have had another bit of luck with the way the fixtures have come out. Their first game is away in Gibraltar and you would have to believe that the three points will be in the bag after that game for the Irish. So who did Mick McCarthy and his boys green get in the qualifiers ?. Out of the hat came Switzerland, Denmark, Georgia and Gibraltar and you would have to agree that as qualifying groups go it is not all to bad. Mick will know he has to hit the ground running if his side are to get to the finals and they had another bit of luck when the fixtures were announced as Ireland,s first game will be away against Gibraltar and you would have to believe they can win that one. One thing for certain on the horizon for Mick that his Ireland side are struggling to find a regular goal scorer and with that in mind he has been trawling the leagues to find one. It is reported that he is to have a chat with Leeds United,s Patrick Bamford and hopes to get the striker to declare for Ireland. The Declan Rice saga is continuing and has to be sorted out sooner rather than later. Mick and his newly appointed assistant manager Robbie Keane have sat down with the West Ham United player and discussed the future. As I put this article together the management team are reported to be very confident that Declan will return to the Irish team but as of yet no announcement has been made. If Rice comes back on board it will be a real coup for McCarthy and it could give him a rock in the defence that he could build a team around. 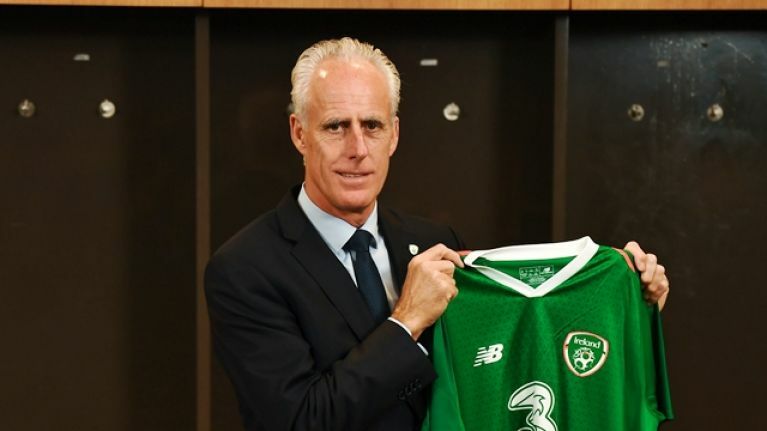 There is no doubt that the mood around Irish football has lifted since the appointment of Mick McCarthy and now there is a lot of hope and belief that the boys in green will actually qualify for the 2020 European Championships. Mick knows that he will have to start off winning games and this will produce a happy factor in the camp and should get a momentum going for the Irish. Football can be won and lost on momentum and as it stands at the moment the Irish need to get back to winning ways. 2018 was an awful year and we do not want to see the likes of it again. There will be a huge difference in the style of play that Mick McCarthy will have his side playing compared to what was played under O’Neill as at times under Martin it seemed like the Irish were making it up as it went along. Mick is a manager who likes to see his team pass and move and insists on total commitment to the cause. It will be a very interesting 2019 for Ireland and one that I expect will be very exciting as well and it all starts in earnest for Mick McCarthy and his team in March.